Some versions of One Integrate client do not include this feature. Tick this option to enable the feature. 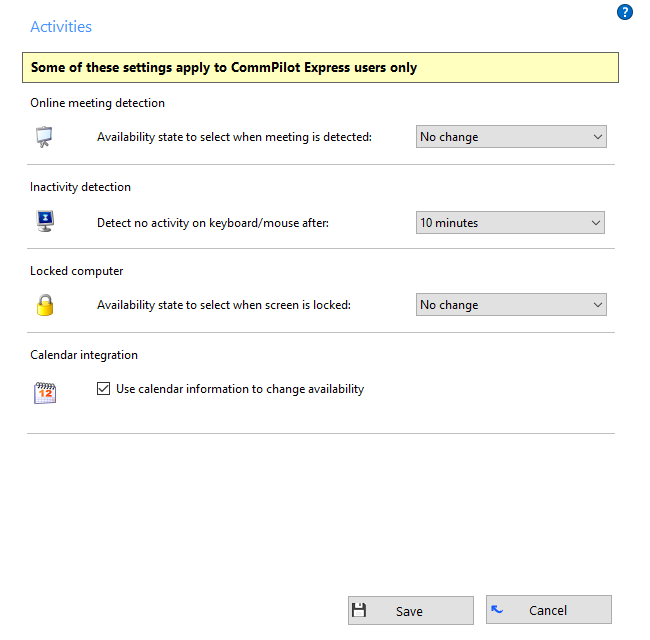 One Integrate client can automatically adjust your availability status when no activity is detected through your computer's keyboard/mouse for a period of time. Tick this option to enable the feature. Select the period of time length from the dropdown list. If you would like One Integrate client to automatically adjust your availability status when your computer is locked, select the appropriate status option from this dropdown list. One Integrate client can use the information stored in your supported calendars to automatically adjust your availability status. Tick this option to enable the feature.